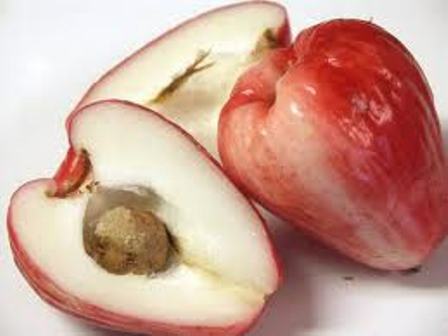 Malay apple is believed to have been originated in Malaysia. It is commonly cultivated from Java to the Philippines and Vietnam. It is also planted in gardens in Bengal and South India. With time, this plant now spread to other warmer regions of the world too. 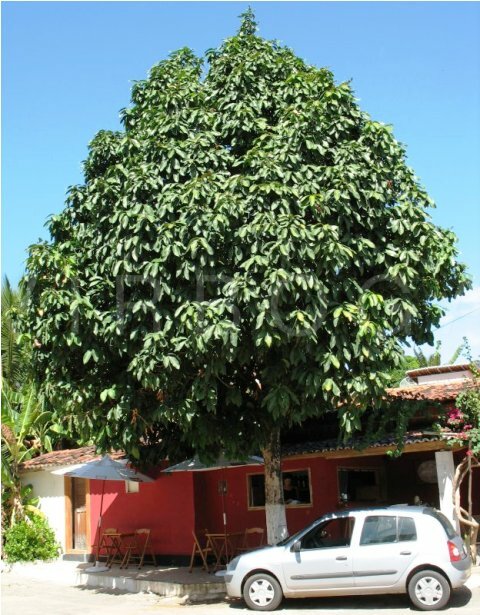 A large handsome shrub, or medium sized tree, 5-20 m high, with nearly straight trunk, 20-25 cm in diameter, and a densely foliaged crown; bark dark grey. Leaves elliptic oblong or obovate oblong, coriaceous, 15-50 cm x 7-20 cm. 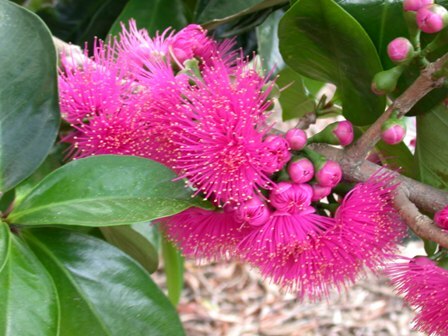 Flowers deep pink or red, faintly fragrant, in dense, short-peduncled racemes, 5-7 cm in diameter. Fruits ellipsoid globose, rarely elongate, red or pale yellow with purple streals, rarely uniformly yellowish white when ripe, 5-8 cm long, rely upto 12 cm, and 5-6 cm in diameter, edible. Seeds 1-2, globose, brown, 2.5 to 3.5 cm in diameter. 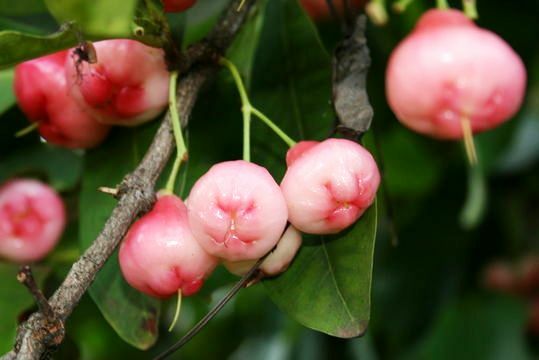 The flesh of the fruit is thick (0.5 – 2.5 cm), juicy and fragrant. The texture is similar to pears, but crunchy like an apple. It is sweet and a great thirst quencher. Some forms of this species bear oblong or pear shaped pale red or pale purple fruits. These fruits are not so savoury as those of forms bearing ed fruits. The fruit is eaten fresh. It is also made into jams or pickles. *According to analyses made in Hawaii, El Salvador and Ghana. In Puerto Rico, white as well as red wine is made from Malay apple fruits. In Indonesia, the flowers are eaten in salads or are preserved in syrup. Young leaves and shoots, before turning green, are consumed raw with rice or are cooked and eaten as greens. The wood is reddish, soft to hard, tough and heavy, but inclined to warp. It is difficult to work, but is employed for construction, railway ties, and for fashioning bowls and poi-boards in Hawaii. In India, the root is reported to be diuretic. It is used in applications for itch. 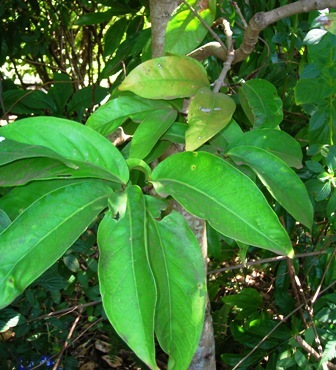 The bark is astringent and used for making a mouthwash for thrush. The dried and powdered leaves are useful for cracked tongue. In India, the tree grows in localities widely varying in climate and soil. It thrives well near fish ponds, canals, lakes or rivers, where the soil is moist and the drainage is good. Propagation can by seed or by budding on rootstocks of the same species. The trees should be planted at a spacing of 8-10 m. In India, the tree blossoms during April and the fruits ripen after then rainy season in October. Young plants are often attacked by termites. The plant is also often attacked by the fruit fly, Dacus dorsalis.